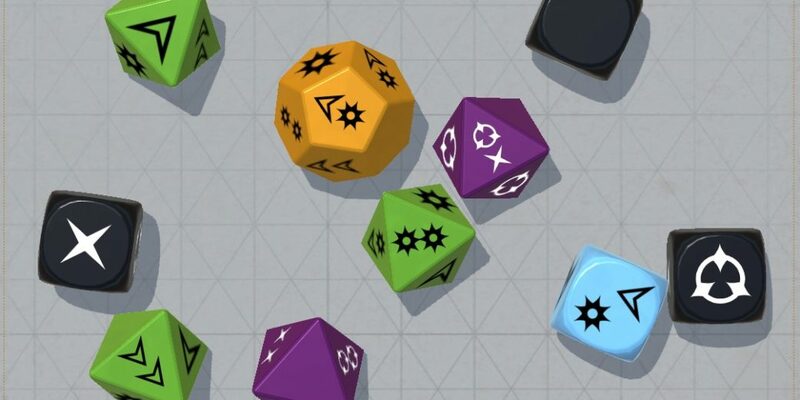 When and/or why should I add the different kinds of negative dice? What do they represent? A player wants to do something. What parts of that thing have to do with Success/Failure and what parts of that thing have to do with Advantage/Threat? How do you resolve weird combinations of remaining dice results? Especially combinations of Triumph with Failure or Despair with Success? The answers to these questions that have worked at my table (and that you hear repeated often within the Genesys/SWRPG community) aren't really what veteran gamers would expect. In some ways, Genesys looks like a semi-crunchy fits-the-mold RPG: six core stats, careers (classes), skill lists, and talents (feats). But Genesys departs from these conventions in a number of significant ways which are important to recognize. These dice (d) come from the inherent difficulty of a task. Apply upgrades and swap to Challenge Dice (d to c) when something could go extremely wrong: chances for an interesting Despair (Y) or from the gamemaster spending a Story Point. These dice (b) come from circumstantial hindrances to the task: things not directly connected to the task's inherent difficulty. It is important to remember that adding b rather than increasing the difficulty (rather than adding d) synergizes well with character Talents which can remove b in specific circumstances, helping the players to feel awesome. These dice (b) come from circumstantial boons to the task, or for very good roleplaying. Keep in mind that adding more than bbb or bbb will start to swing the odds of the dice pool significantly and make player skill/characteristic (generating d/c) less relevant. The Players imagine and describe what the "good" results (Success/Advantage/Triumph) mean. The gamemaster may veto anything that stinks like bad cheese. The Gamemaster adjudicates and describes the "bad" results (Failure/Threat/Despair). Sometimes players will give suggestions (which are sometimes worse than what the gamemaster had in mind). Both the Star Wars Roleplaying core books and the Genesys Core Rulebook have chapters devoted to the skills. The Star Wars books give detailed examples of how to interpret symbols for each skill in the game. These examples are specifically noted to be recommendations based on choices that worked for the developers and early play testers. However, they might not be a good fit for every game group. They haven't been a good fit for any of mine. The skills chapter from the Genesys Core Rulebook does a better job by shying away from specific results and delineating the skills by when-to-use and when-not-to-use each skill. That's actually pretty great, but it doesn't help when trying to understand what to do with the dice results. The real key is groking that interpretation in Genesys games is a contextual, improvisational, and collaborative process. It isn't always going to be consistent from setting to setting, or even session to session, though principles and house rules are likely to evolve in your setting. S Success Intent Achieved Extra Damage on Hit The action succeeds. Grant one more bit of something (see Granular Results). A Advantage Positive Side Effect Recover Strain, or Activate Quality Mostly contextual and player narrated. Reduce time required to complete a task. X Triumph Major Positive Effect Critical Injurty, or any number of Advantages Immediate 'awesome' moment for a player. Extend the 'awesome' for even longer. F Failure Intent not Achieved Attack Misses The action fails. Increase the duration of 'let it ride' (see Granular Results). T Threat Negative Side Effect Suffer Strain Mostly contextual and gamemaster narrated. Raise the narrative tension. Y Despair Major Negative Effect Out of Ammo, Damaged Gear, Hit Wrong Target An immediate disaster for the player. Extend the disaster in time or compound its severity. Having extras of a dice result can be one of the trickier things to adjudicate for new gamemasters. Especially, "when should extra S versus A (or extra F versus T) do more of this one thing versus that other thing?" My solution is to always consider player intent. Extra S should amplify the intended accomplishment, while extra A should result in either more, separate boons when spent discretely or an amplified, single ancillary boon when spent together. This principle can result in the appearance of inconsistency if one doesn't consider player intent. For example, when making an Astrogation check to jump-to-lightspeed in a Star Wars game, should extra S or A speed up the time it takes to "make the calculations" or shorten the duration of the hyperspace trip? It depends on the player's intent when they make the check. If fighting in space combat and trying to make a quick getaway, S might speed up calculations (intent) and A might shorten the trip itself (ancillary). However, if trying to deliver smuggled goods on time to a crime lord (or before the unrefined coaxium destabilizes...) S might shorten the trip itself (intent) and A might speed up the hyperspace calculations (ancillary). Some checks are made in search of information or can otherwise return actual granular changes in the world to players. In this case, for example, each extra S searching a village library for books about the Old Ones might reveal one more bit of information. Whereas A or T might improve or degrade the quality of specific revealed pieces of information. When navigating a dense jungle with a Survival check, each extra S might be one more bit of distance traveled in the intended direction (and extra F might do the opposite). There's a longstanding principle in narrative RPGs to let the results of a dice check ride, so to speak, for a while before allowing a reroll of the same check. This principle is used to avoid things like lock-pick spamming. I sometimes use extra F to say, "well, something happened because of all those F you rolled. Now you can't roll again for some proportional amount of in-game time." Y but overall S, and/or along with a bunch of A.
X but overall F, and/or along with a bunch of T.
Results like these look hard to resolve when the implicit assumption made is that they must all be resolved at once, together, and synergistically. But that's not what happens (or should happen) at the table. Results are broken down piecemeal, with good results narrated by the players and bad results narrated by the gamemaster. A player decides to make a Coercion check to get information out of a captured Imperial Officer. It succeeds, but with a net result of YSSAAAAA. Player: Success! He tells me where they're holding the prisoner. Gamemaster: Yes, but he looks hard into your eyes in a moment of silence after giving his answer. You're stunned by the sheer hatred, and realize that you may have made an enemy for life. Before you can react, he looks over your shoulder, seeing something, grins, and kicks you in the groin. He darts past you and out of your reach as a group of Stormtroopers (seemingly out of nowhere) open fire. Now, before combat begins, what do you want to do with those Advantages? Player: I dive forward, pulling my squad mates out of the way in time to avoid the blaster fire. Gamemaster: Great! Everyone roll Vigilance for Initiative. You'll all start the combat with the benefits of good cover (bb added to incoming ranged attacks). When you break down a group of results and resolve them one at a time, there shouldn't be any combination of symbols that can throw you for a loop.